The Attorney General of Mexico has failed to properly investigate all lines of inquiry into allegations of complicity by armed forces and others in authority in the enforced disappearance of the 43 students from the Ayotzinapa teacher college, said Amnesty International today after meeting with family members of the victims. At an Amnesty International press conference today in Mexico City experts will critique the faltering investigations overseen by the Mexican Attorney General Jesus Murillo Karam and will outline the demands of the parents of the 43 students. The Attorney General’s office said that all lines of enquiry have now been exhausted. “We have a catalogue of concerns over the way the investigation has been run and whether the full range of these crimes, including enforced disappearance and the killing of six people when the students were first attacked have been fully addressed,” said Erika Guevara Rosas, Amnesty International’s Americas Director. This latest call comes the day after Austrian forensic scientists announced that they had been unable to identify the DNA from badly burned remains found in a mass grave. Further tests on the samples could take months. The enforced disappearance of the students has highlighted Mexico’s appalling human rights record. More than 100,000 people have been killed in Mexico since the “war on drugs” began in 2006 at least 23,000 are missing, according to official data. Thousands of communities have been displaced by the increasing violence and Amnesty International continues to receive reports of human rights violations committed by police and security forces including arbitrary detentions, torture and enforced disappearances. 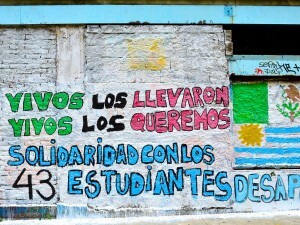 “The disappearance of these students is a crime that has shocked the world. This tragedy has changed the distorted perception that the human rights situation has been improving in Mexico since President Peña Nieto took power. There are thousands more cases that have barely been investigated in Mexico, they cannot be ignored anymore,” said Erika Guevara Rosas. “Much more needs to be done to investigate the many cases where there are signs of collusion on the part of the authorities and security forces in human rights abuses, for example the mass execution of civilians in Tlatlaya and the massacres of migrants. Tragically, impunity for these terrible crimes remains the norm. Federal and state institutions are failing to fulfil their human rights obligations, sending the message that these abuses are actually allowed,” concluded Erika Guevara Rosas.